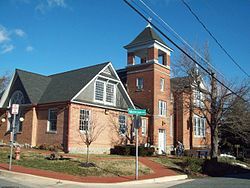 I spent the fifth and sixth grades at St. Mark’s Old School, on Winters Lane in Catonsville. It was the original school, built in the 1880s, and had been recently replaced by a fancy, modern, up-to-date once, complete with green blackboards and yellow chalk. Between planning and opening, it proved to be not quite large enough to accommodate those baby boomers who were surging into classrooms, and the decision was made to keep those two grades in the original building, the one that actually smelled like a school, old books, paste, construction paper that was reverting back to its original state. It had a trash room, where we deposited the remains of our brown-bag lunches. I remember this, because, after the second time that I accidentally threw my retainer away with my banana peel, my father took me there to search for it. I found it, and, needless to say, never lost it again. But the fondest memory I have of that time is leaf houses. Every autumn, as the trees surrounding the girls’ playground (for boys and girls had separate play areas then), shed their leaves, we girls would divide ourselves into groups and devise the diagrams for our houses; the leaves marking off the dimensions of the rooms. I always made one to match the house I lived in. I never deviated, and, somehow, those others in my cheerful assembly always went along with me. We raked and swept and organized: kitchen, dining room, living room, sunporch, even a library. If we had time, we even added a front porch, that outlined by a narrower band of leaves. We felt singularly grown up, and would invite other groups in to visit. I don’t remember a cross word; I don’t competition, though each of our groups was quite house-proud. Of course, there was always one boy (Walter J. O’Neill III comes to mind) who would strike out from his side of the school, leading a band of ruffians to swoop in and destroy our diligent efforts. And, of course, we ran to the nuns, who, always a bit late, came to our rescue and swatted the hooligans on the top of their heads, boxed their ears, and confined them to the classroom for the next day. We then picked up our brooms, our rakes, and started again. Gender roles, so easily assumed, never questioned. Such quarantining of the sexes would never fly today. Yet, I miss those leaf house, and, just perhaps, some of us went on to be architects.